Distribution : Tropical Indo west Pacific. This sea slug is easely distinguished by the magnificent, marginal bright blue (white in our specimens) blocks of color which appear in series separated by black area of pigment. The yellowish orange dorsal surface of the notum is absent in many areas which circles or irregular patches of blue (white in our specimens) to lavender are visible. These patches are different sizes and shapes and the largest of which are raised on low pustules. 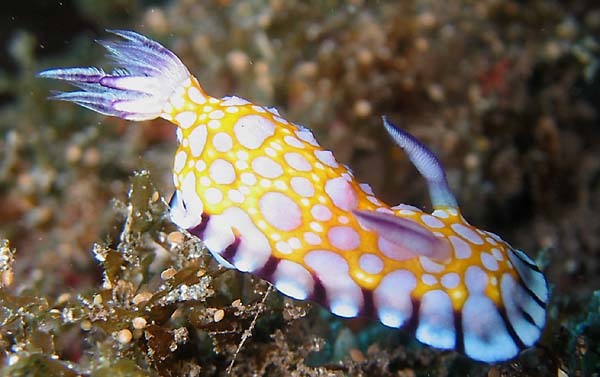 The rhinophores are creamish with a purple streak up both anterior and posterior axes. 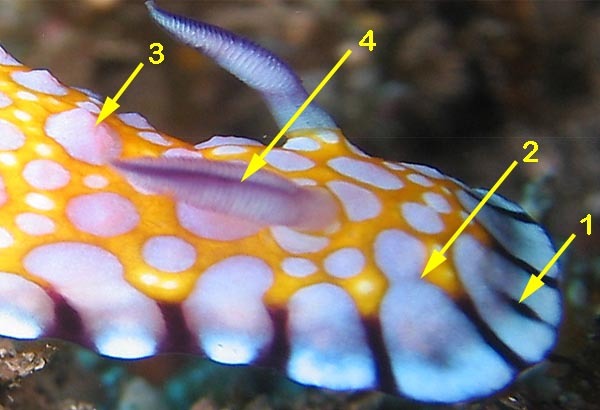 There is a bit of colour variation in the sea slug, and there are two forms : a streaked and a spotted colour form ( see Bill Rudman sea slug site). The 6 specimens we have found are spotted form as shown on our photo. As G.conchyliatus it raises and lowers its anterior end when actively crawling. The marginal bright blue (white in our specimens) of color are squarish or rectangular in shape with edges that are rounded of varying degree. The black color sometimes extends into the outer edges of the blue area, bisecting them to varying degree. The blue coloration often extends inward from the black marginal band interrupting the yellow-orange pigment which covers most of the notum of the animal. In some specimens dark brown blotches cover the dorsal surface to varying degree. These areas appear wine-colored or black depending on the amount of pigment present. 1 : The black color sometimes extends into the outer edges of the blue ( or white) area, bisecting them to varying degree. 2 : The blue (or white) coloration often extends inward from the black marginal band interrupting the yellow-orange pigment which covers most of the notum of the animal. 3 : Dorsal patches are different sizes and shapes and the largest of which are raised on low pustules. 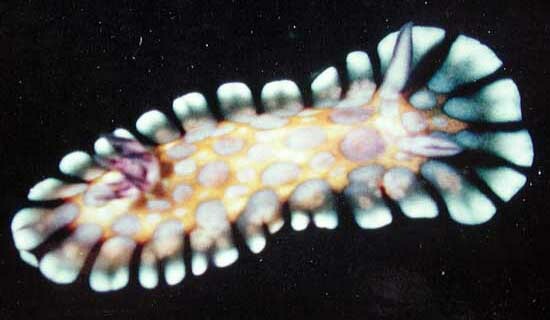 4 : The rhinophores are creamish with a purple streak up both anterior and posterior axes. "La Barge" at St Paul, 26 m, 3 February 2007, size : 30-35 mm. 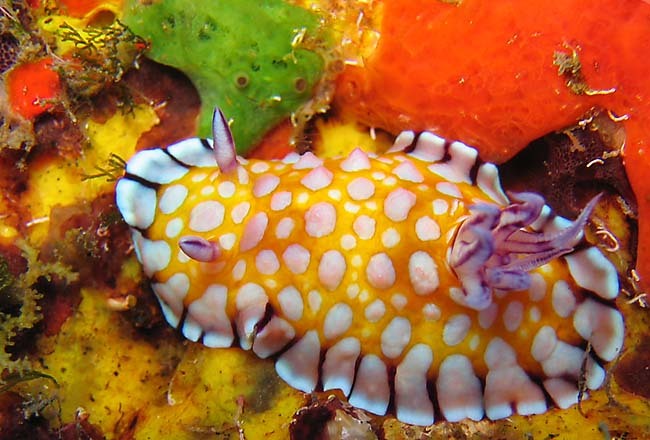 A very colored photo of this seaslug crawling on a anchor's wreck. May be a juvenile form ?